Today I have yet another amazing mini from the one and only Darren Latham, master painter extraordinaire. 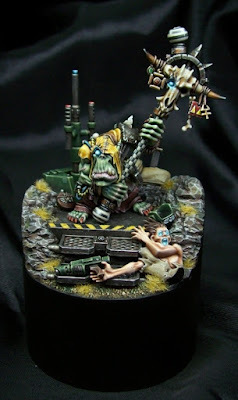 This is a great use of a Fantasy mini for 40k, admittedly Orks are one of the easier models to cross pollinate. He didn't just stick on a gun on him or something though, the conversion work on this is effective and subtle. The biggest change is the staff, which looks suitably Orky for the 41st millennium. I really like how the staff head echoes Ghazkull's banner pole. There are a ton of other little details scattered around the mini to bring him into the future such as random control panels, wires, and of course his, I'm assuming, bionic eye. The diorama base completes the transition, firmly rooting him in 40k. The poor Imperial solider that looks like he has just been afflicted by some horrible psychic attack is a nice touch to finish it off. If I'm not mistaken I believe that model originates from the Vampire Counts Corpse Cart. As one would expect from Darren Latham, the painting is top notch. The Bad Moonz have always been an eye catching Ork tribe with their bright yellow colors, and that scheme is certainly done justice here. All of the blending is smooth and flawless with crisp and bright colors. Honestly, it's hard to comment much on the painting here since I have yet to see Darren do a less than outstanding job on a mini. 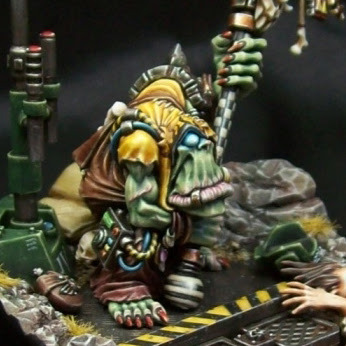 The one comment I will make is that the checker pattern on the staff it outstanding and the perfect Orky touch. Today I also have another teaser video for the next installment in The Endless Deserts supplement series for Age of Sigmar. I'm pretty excited about this ruleset and everyone who has tested it out, including myself, has had a lot of fun with it. Check back on Monday to find out more!